Check my Instagram, I like to post beautiful pics of where I’ve been and what I’ve been doing. This week I road tripped with my sister, Sophie and my pup Summer. 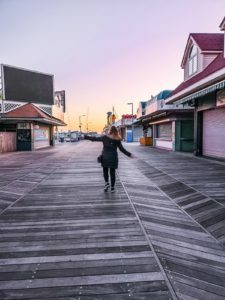 We rented a car and drove down the Garden State Parkway to Cape May, stopping at Atlantic City to walk on the board walk and shop in the outlets. Used the service station to pick up massive vats of coffee, crisps and doughnuts. Stopped for chowder and crab cakes at Fins Bar & Grill which was dog friendly, so bonus. Explored the light house and the concrete ship… we stayed in Wildwood (at a semi-decent Quality Inn), for an impressive sunset, but a completely shut boardwalk (although phenomenal dog park on the beach)… in fact so quiet, the only dinner option was a takeaway pizza, but who’s complaining. On the way home we reminisced on the fun days of watching Jersey Shore and marched the Seaside Heights Boardwalk. 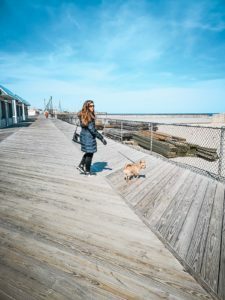 I love a board walk and driving… the Nissan Rogue did the job and made me feel awesome, driving around. The sale of my flat was on a knife edge. Complications with the head leaseholder and the buyer getting cold feet due to BREXIT. Rather than focusing on having fun, the pit of my stomach was churning, my mind was racing with ideas and the phone was ringing. Hands free whilst driving doesn’t cut it, because I can’t drive plus talk on a call… so I’d have to keep stopping, which meant sitting outside of places, phone to my ear, cross legged, hunched over. No way to spend time off… but it had to be done. In fact, I couldn’t sleep over night, because my mind was mulling everything over (oh and Summer decided she had to grrr every time she heard something, just to make sure I was aware that she was watching out for me). The usual plan is to do an hour of work in the morning, which includes answering emails and putting out social media posts. Then putting everything away and going an enjoying the day. In reality, that doesn’t happen. I’m still learning to switch off and ignore… but when I’ve got such a big deal on the table, I don’t seem to be able to make that happen. And unfortunately, I can feel that stress for the next few days… because of course, it still rumbles on. So yes, it’s brilliant that I can take off at the top of the hat. But that doesn’t ever mean shirking my responsibilities, and that can mean having to pull off the road, take a deep breath and make that phone call. P.S. To keep up with what’s going on in my life make sure to subscribe using the red bell in the bottom right hand corner! ← Should You Buy A Property That Already Has Guaranteed Rental Income?